Japanese firm has an out-of-this-world solution to our planet's power woes — building a solar panel array around the Moon's equator and sending the electricity it collects back to Earth. The project called LUNA RING is being developed by construction firm Shimizu Corporation. According to the firm, such a system would be capable of sending 13,000 terawatts of power back to Earth and that construction could begin on the project as early as 2035, Phys.org reported. To ensure continuous generation of power, an array of solar cells will extend like a belt along the entire 11,000km lunar equator. This belt will be built in width from a few kilometres to 400km, the company said on its website. Robots will play a vital role in construction on the lunar surface. They will be tele-operated 24 hours a day from the Earth. The concrete would be covered with solar panels, which would be connected via cables to microwave and laser transmission stations. 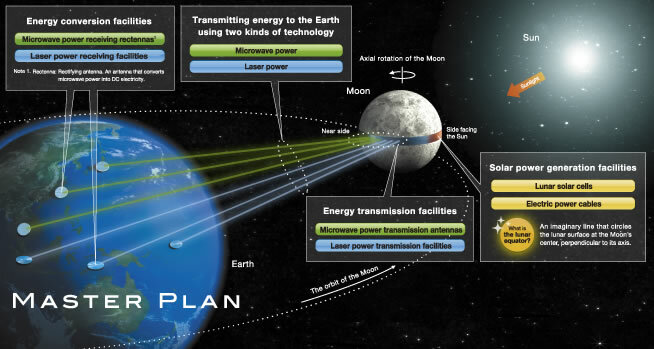 The energy beams sent from the Moon would be directed at receiving stations on Earth, allowing for a round-the-clock source of energy as there are no clouds or other bad weather on the Moon. The cables will transfer the electric power from the lunar solar cells to the transmission facilities. High-energy-density laser will be beamed to the receiving facilities using 20kmdiameter antennas. A guidance beacon (radio beacon) brought from the Earth will be used to ensure accurate transmission. Materials needed for the construction and maintenance of the Solar Belt will be transported along this route. Electric power cables will be installed under the transportation route. The plants will move automatically while producing solar cells from lunar resources and installing them. Since the earthquake and tsunami that struck Japan in March 2011 — which led to closing the country's nuclear power plants — scientists have been scrambling to find ways to create electricity for the country in other ways. However, the project doesn't address the costs and considerable hurdles it would have to overcome — important among them would be building such a massive structure from such a great distance.